The Quantum Mass marks the new standard in fusion splicing. 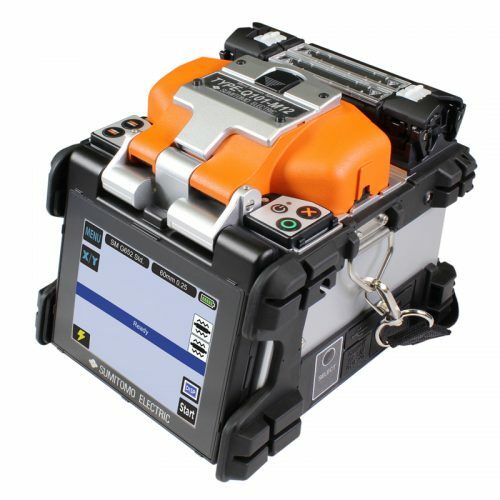 It is the industry’s first and ONLY mass fusion splicer with Automatic Clamp Force Adjustment and Live Time Clamp Force Calibration that allows for real-time fiber offset adjustment for the lowest insertion loss for splicing ribbon fiber and MPO terminations. It’s the industry’s fastest mass fusion splicer, taking less than 70 seconds for a 12 count fiber splice. Other industry first and ONLY features include: fully navigational touch screen for optimum user friendliness; SD port for virtually unlimited data storage, plus video, audio, and software uploads and downloads; internet interface for remote maintenance; and the longest electrode life – with legendary reliability common to all Sumitomo splicers. Sumitomo’s Quantum Mass is the industry’s lightest, smallest, and most advanced mass fusion splicer, yet it’s also more rugged with superior dust, shock and water-proof resistance for even the harshest environments. The built-in dual heater system, a Sumitomo Electric innovation, reduces heater wait time and improves splicing efficiency by 70%, yielding a splicer with unprecedented speed, performance, and reliability.